For centuries, we have been searching for the fountain of youth. Something to turn back the aging process. Short of cosmetic surgery, little options have been available, until now. Phytoceramides are the latest offering in anti-aging treatments promising a healthier skin and more youthful look. The difference here is there may be scientific data that proves it works. Ceramides are found in the lipid layer of the skin. They maintain the skins elasticity, and help it stay smooth and youthful looking. Ceramides help in tissue moisture retention for continued hydration. As you start to age, you begin to lose ceramides, which then cause the appearance of fine lines, wrinkles, skin damage and dryness. The effect of losing ceramides is literally what causes the appearance of the aging process. In a clinical test published in the 2010 International Journal of Cosmetic Science, the results of a 12-week study showed that ceramide replenishment significantly increased skin hydration and improvement in itching, squamae, roughness and redness of the skin. The ceramide replenishment used in this study was wheat extract oil. When extracted and formulated into a supplement, wheat extract oil, which also contains ceramides, can effectively replenish lost levels of ceramide and reverse the signs of aging. With this proven data, the market has been flooded with Phytoceramides treatment products like MaritzMayer Laboratories PhytoRenew 350 claiming to reverse the aging process and leaving you with healthier, more youthful looking skin. With all of the available options, it’s important that you select one with the right ingredients, dosage and price. The manufacturer recommends taking one (1) capsule daily as a dietary supplement. The manufacturer cautions that pregnant or nursing mothers, children under the age of 18 and individuals with a known medical condition should consult a physician before using this product. When looking on the manufacturer’s website, pricing could not be found. They ask that you call or email for a free quote. They do sell the product in bottles of 30 capsules, which under the suggested use should last about one month. I would be weary of products that you cannot buy direct or products that offer free trials. Often these free trials turn into unsolicited charges to credit cards for products that you have given no prior approval for. 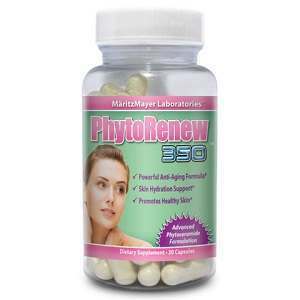 MaritzMayer Laboratories PhytoRenew 350 may be an effective Phytoceramides product, but when looking at the price of this product, its ingredients and that they do not offer a guarantee, one might start to think that there has to be a better product out there. Jack Webster	reviewed MaritzMayer Laboratories PhytoRenew 350	on February 24th	 and gave it a rating of 2.